All it takes is one weakling, and Michael Cohen is a weakling. 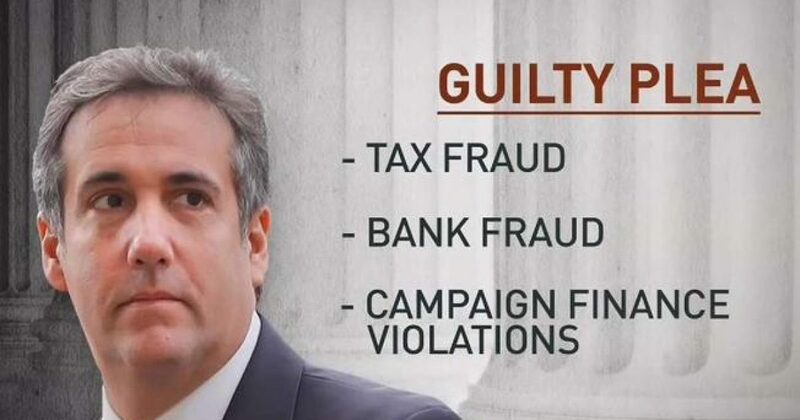 Cohen was sentenced to three years in prison for a variety of crimes yesterday involving tax evasion, bank fraud, and lying to Congress. He was also fined $50,000 for a campaign finance violation, which is very key. Cohen was never tried for a campaign finance violation, which carries a civil, monetary penalty, not criminal. He pleaded guilty to the violation in a deal with special prosecutor Robert Mueller. Why did Mueller want to pin a campaign finance violation on Cohen? Because it is the only way to implicate President Trump. Here is how Mueller, the Democrats, and the liberal media are spinning the conviction: Because Cohen pleaded guilty to a campaign finance violation, Trump is therefore guilty. So, what is this mysterious campaign finance violation? Paying off Stormy Daniels and another professional whore to keep quiet about affairs they allege but the president denies and no one has any evidence of, let alone proof. It was not a crime or a campaign finance violation for then-Candidate Trump to pay off Daniels unless the payment came from campaign funds, which it did not, according to President Trump. So, given that the president used his own money instead of campaign money to pay off Stormy Daniels, there is no violation there. And, even if the payoff money had come from campaign funds, it would be a civil, monetary penalty, not criminal. Proof of that is the fact that Cohen was fined $50,000 instead of given jail time for that guilty plea. You can be sure the payoff money came from the president’s personal funds rather than campaign funds or else you would hear the mainstream media screaming it from the rooftops 24/7. Had Cohen pleaded not guilty to the campaign finance violation and been tried for it, there is no question that he would have been acquitted as there was no violation there. But, that would have ruined Mueller’s hand. He had to have something to implicate President Trump. So, Cohen pleaded guilty to a bogus campaign finance violation. What would have happened if Cohen had refused to plead guilty to a bogus campaign finance violation that implicates President Trump? He would have been sent down the river for 20 to 30 years for tax evasion and bank fraud. And, that’s the way our sick criminal justice system works. “Former Trump attorney Michael Cohen has been sentenced by a federal judge in Manhattan to three years in federal prison, followed by three years of supervised release for the eight counts brought by the U.S. attorney in the Southern District of New York, in a sentencing hearing in which Cohen said he acted out of “blind loyalty” to President Trump. In CBS’s second sentence they are struggling to claim that the 3-year prison sentence “stemmed from Cohen pleading guilty to campaign finance violations related to payments to women alleging affairs with Mr. Trump.” They screw it up badly. The sentence is hardly intelligible. Ummmm, AP, you are lying! Cohen was convicted of tax evasion and other crimes unrelated to Trump. It is not a crime to pay a woman to not talk about an affair she claims but probably never happened. Your poor excuse for journalism is trash! not necessarily. They're still investigating Trump and they cannot release evidence if it is going to undermine the other investigation. They are NOT investigating Trump. That has only been said about a thousand times. Why do you insist on lying like the mainstream media?